When I first started blogging, I met Nancy, and we’ve been “pretend friends” ever since. She is a writer that explores her faith in a thought provoking way, but she adds a little salt and pepper to her posts to make it interesting. Plus, she posted a video of the Muppets doing a Patriotic number on her Facebook account for the 4th of July and you know I’m a sucker for Muppets. Sam the American Eagle? Love. Anyway, I adore Nancy, and I think you should all be reading her blog (if you aren’t now). She inspires me and makes me laugh, which is a nearly impossible feat. I asked Nancy to write about her belief that God really is GOOD. Check out her blog, follow her on Twitter or, if you are basically interested in Muppet videos (aren’t we all) follow her on Facebook. Thank you for sharing your story, Nancy. It’s beautiful. See that mountain lake I’m hiking toward in the distance? There was a time when I wasn’t sure it really existed. My husband, the beloved Swede, is a wilderness hiking-guy extraordinaire. 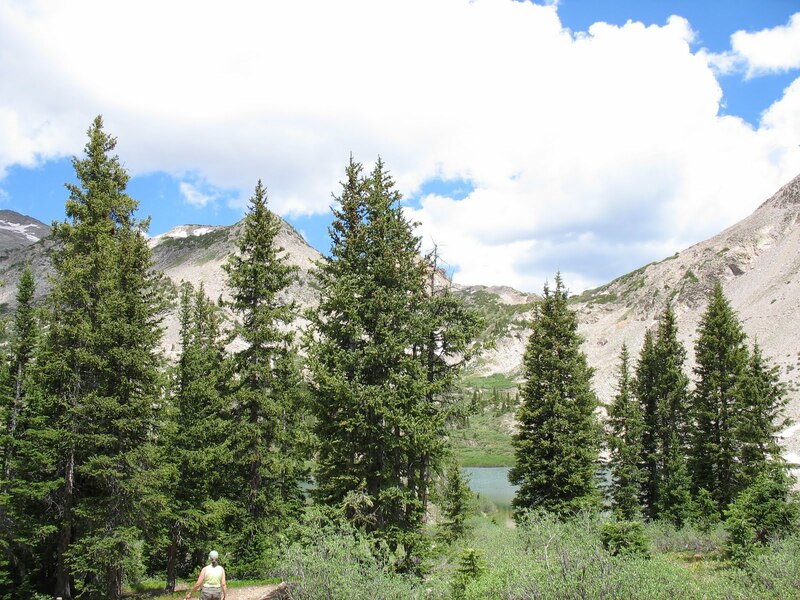 During last summer’s vacation, he suggested a hike near Crested Butte, Colorado, leading to a place called Copper Lake. The trail began at 9600 feet of elevation (where there is no oxygen) and climbed to a height of 11,300 feet (where there is even less of the stuff). My husband reminds me of that hike from time to time, when he sees me getting tired and frustrated by life’s twists and turns. At times, God has asked me to walk paths that were difficult, ones fraught with dangers, toils, and snares. He’s called me to climb hills I didn’t particularly want to climb. And sometimes I’ve gotten tired and cranky, and begun to question God’s goodness. I was devastated when I learned my body was incapable of making babies. My husband and I prayed, we sought medical treatment, we pursued adoption. This was not the path we had envisioned for our lives. It was hard. It was painful, humiliating and expensive. We had no idea how long our journey would last or whether, at the end of it, there would be babies. Looking back on our journey through infertility and adoption, I see the places where God met, encouraged, and sustained us. We had dear friends sharing a similar struggle who walked with us along the way. Our insurance covered most of our expenses. I had a friend whose sister was the social worker for our adoption at the local office of Bethany Christian Services. God demonstrated His goodness, not only in satisfying our desire for children, but also in placing His hand upon and giving us the very ones He knew we needed. I cannot imagine my life without them. I would have despaired unless I had believed that I would see the goodness of the LORD . . . wrote the psalmist (Psalm 27:4, NAS). I’ve been walking another difficult road lately. Some of it has been a fairly steep climb. At times, I’ve been certain I was nearing the end; the clearing was almost within view. Then the road turned sharply and unexpectedly and began to climb again. I’ve been tempted to curl up in a heap alongside the road and give up in despair. I’ve wanted to scream in agony. But I cling to the words of the Psalmist, and I remember where God has demonstrated His goodness to me in the past. I look for the signposts and the cairns along the way, evidence of His presence with me, and I find strength for each stumbling, faltering step. And I continue on. Because sometimes, as my husband reminds me, I just have to trust that there really is a lake at the end of the trail. Here's to finding the lake at the end of the trail and the God who gets us there! Thus us such a wonderful reminder! I live the images she shared. This is such a wonderful reminder! I live the images she shared. I count it a blessing that I can call Nancy my friend and peek in at her trail(trial) to the lake occasionally. What a sweet Christian friend!! She is as real as her blog sounds. I am a new fan. Loved it! You picked a good guest poster, JoAnn. As for you, Nancy… your story here made me weepy. I've had some difficulty believing in lakes myself, at times, especially when the road gets really twisty and turny. But I'm holding on in faith, too. And that verse? One of my all-time favorites. oh you know i love you nancy. you seem to be posting everywhere these days…as well you should be. perfect words here today. thanks joann, for hosting nancy. We all can struggle with doubt when the road to the lake is steep. Thanks for this picture of faith, Nancy. It will stick with me as I'm climbing. Oh, I know this, Nancy. The struggle with infertility is a hard journey. And I was like you at times wondering where in the world the end would be. His plan was so much greater than mine. So much greater. I”m a bit weepy after this one too. When I doubt God's goodness (an I'm ashamed to say that sometimes I do), I'll remember this story, Nancy. Evidence of His goodness. What fun, hanging out with JoAnn and friends old and new here today. Thanks so much for inviting me to Ostrich-world! Like JoAnn, you create perfect metaphors for the loveliness and struggles in the world. My heart feels full having read your words. This was gorgeous, wise, true & uplifting! I loved your every word!! AHHH blogger will not let me sign into my own blog ! this is JoAnn here, saying THANK YOU to nancy who came and blessed us with her words, even though there is a massive shortage of ostriches. What a perfectly delightful and encouraging post, Nancy. Thank you! Nancy. Pretend friends like you …. well you are a lake in a way. Sometimes it's like we are all those little places of real to each other. and thank you JoAnn . You know I heart you. This was really beautiful. Thanks for having her guest post! It is my biggest comfort and at times, my biggest struggle. And it is always my ending prayer at night, that I will follow and abide by the Lord's plan for me. Beautiful post, both of you ladies. I hope your days are filled with sweetness and light. Enjoy your bustling brood of three. I'm so, so glad I stopped by here today. Such an encouraging and beautiful post. It came on just the right day at the right time. He knows, doesn't He??? This post itself was my lake at the end of the trail! JoAnn, thanks for hosting Nancy! Hope you are getting at least a little bit of good sleep. And Nancy, thanks for this reminder of His goodness. I know the feeling of wanting to just crumble. We're all going to make it to the lake; can't wait to all meet up there! “hi joann” (whispering so as not to rouse you from your sleep).